So here we are on the creepy crawly page, or least one of them,doesn't it want to make you scratch and itch and yuuuukkk.!! You can either click on the links above or read a bit about insect biology first...the choice is yours. Don't worry the insect biology we cover is only basic, so have a good look at the picture below which has the most relevant labels that the average person needs to know.. In the case of the cockroach, the pro thorax, which is directly behind the head, is sort of extended and flattened forward and thus covers the head like a cap, this is know as the pronotum. Also makes for abetter crunchchchch.. There is also a term called metamorphosis, this is what will happen to me when I win the lottery, seriously, this is how an insect develops. Complete (holometabolous) Metamorphosis, this has the four stages of egg, larva, pupa and the adult. Incomplete (hemimetabolous)Metamorphosis, this has three stages, egg, nymph (this casts it's skin several times and changes occur) and adult. Ametabolous Metamorphosis, hardly any change except for size between the nymph and the adult. 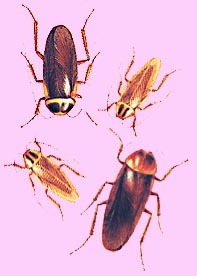 Cockroaches are part of the order DICTYOPTERA and of the sub-order BLATTODEA. They are rather flat insects with quite long antennae and also long spiky legs, boy!! can they move. Most of them have wings but can only fly when temperatures are quite high. Generally speaking, cockroaches are omnivorous, in other words they will eat anything, including each other if there is no other food source available. Cockroaches are regarded as a primitive insects and fossil species from the Carboniferous period, that's about 250 million years ago, are very like those known today. There are about 3,500 different species of cockroach with the vast majority living in the open and almost never coming into contact with man. The majority of cockroaches are tropical with only a few small species native to our wonderful climate, but those tropical ones which have found their way here, in the last 200 hundred years, are pretty much dependant upon our heated buildings, especially hospitals, laundries and kitchens where conditions are hot and steamy. Cockroaches are very gregarious, like to party and boogey on down, yeah man..! !, and they emit an aggregation pheromone, in other words a gathering together smell, which is why you see lots of them together when there is a problem. On this page I am only going to cover the four main species which give us problems in the U.K.
Cockroaches are common in commercial premises associated with the production or handling of food. Also in public buildings and domestic premises eg blocks of flats. Gregarious and nocturnal, they spend the day hiding in cracks and crevices around such areas as sinks, drains, cookers, the backs of cupboards and in refrigerator motor compartments. They especially favour buildings with service ducts and complex plumbing installations. Infestations may be introduced as egg cases or adults in incoming laundry, on raw materials, in crates and packaging, or arise as the insects enter buildings via such routes as drains or refuse chutes. Cockroaches are potential vectors of diseases such as dysentery, gastroenteritis, typhoid and poliomyelitis. Their diet is omnivorous and includes fermenting substances, soiled septic dressings, hair, leather, parchment, wallpaper, faeces and food for human consumption. The latter may be contaminated either by the mechanical transfer of causative agents of disease from the insect’s body, or by transmission in the faeces. An outbreak of food poisoning in a Brussels hospital subsided immediately an infestation of B. germanica was controlled. Cockroaches and their faeces may cause allergic reactions especially amongst sensitive individuals eg asthmatics. Exposure may result from ingestion or through the inhalation of materials derived from cockroaches in airborne dust. In addition, food may be tainted with the characteristic smell of the cockroach, which is produced by faeces and salivary/abdominal gland secretions, or by the dead insects.